Sponsorships and Events Manager at Chinwag & Social Media Week London. Lover of media, events, radio, music, fashion, travel & creative arts. Drama Queen. Social Bee. Fashion Victim. 15 hiring companies, 20+ advice mentors, 1000+ job seekers! Friday 28th September marked the end of the beast that is Social Media Week London with Chinwag's Careers Day supported by JobisJob at The Vinyl Factory Soho. Hundreds of highly qualified students, recent graduates, and experienced professionals came along to speak with a great lineup of companies looking to hire including Nokia, Dow Jones, Imagination, Milkround, Financial Times, News International, Ve Interactive, Tempero, General Assembly, Enternships, 1000heads, PutItOut and more. Job seekers and careers movers were queuing for CVSurgeries and Portfolio Reviews from industry professionals and we could see a vibration of enthusiasm for all things digital spread throughout the room. 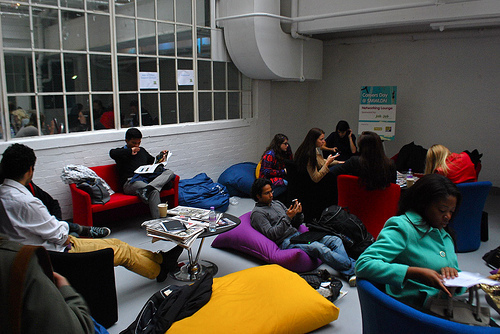 Our Chill Out Lounge gave attendees an opportunity to recharge (physically and electronically! ), make the suggested amendments to their CV/Portfolio from their advice sessions and network. Want to know what holds the key to global enterprises unlocking up to £800million in economic value on a yearly basis? Social technologies have been the fastest adopted form of media in human history, and according to McKinsey Global Institutes (MGI) recent report “The Social Economy: Unlocking Value and Productivity through Social Technologies" we're still only at the beginning of what the potential impact of these technologies could be. Two-thirds of this potential £800million lies within the need to improve collaboration and communication within and across enterprises. Social technologies are no longer merely a 'new media platform', but an increasingly necessary business tool. MGI’s findings suggest that by fully implementing social technologies, companies have an opportunity to raise the productivity of interaction workers - high-skill knowledge workers, including managers and professionals - by 20-25%! Two-thirds of this potential value lies in improving collaboration and communication within and across enterprises. Need a foot in the door into the digital and social media world? Eager to get yourself in front of leading brands and agencies? Feel you could do with some advice on improving your CV and Portfolio? Want an inside view into how recruiters view your job profile? If you answered YES to one or more of the above questions, it sounds like you need to get yourself to Chinwag's Careers Day at Social Media Week London on Friday 28th Sept 2012! Hundreds of graduates, job seekers and experienced workers looking for that next challenge will be flocking to the Careers Day to meet the likes of Nokia, Imagination, News International, Ve Interactive, Dow Jones, Milkround, PutItOut and more! So don't miss out - REGISTER NOW! Check out the Programme below. Are you a job seeker in the digital and social media sector? Eager to get yourself infront of leading brands and agencies? Feel you could do with some advice on improving your CV or Portfolio? Interested in getting an inside view into how recruiters percieve your job profile? 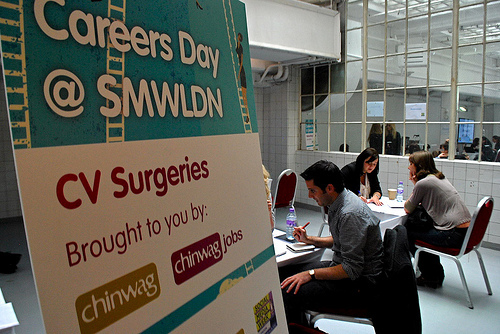 Sounds like you need to sign up for Chinwag's next Careers Day at Social Media Week London, supported by JobisJob UK on Friday 28th September! Hundreds of graduates, jobs seekers and experienced workers looking for that next challenge will be flocking to the Careers Day to meet the likes of Nokia, Financial Times, Imagination, Tempero, News International and more, so don't miss out. REGISTER NOW - it's free! Check out the Programme below! To kick start Social Media Week London September 2012 in the most inclusive, collaborative and 'social' way possible, we're sending out an open invite to join us for a Brainstorming Session on Thursday 26th July 2012. The aim of the evening is to generate ideas and hopefully help create some inspiration for your SMW involvement. 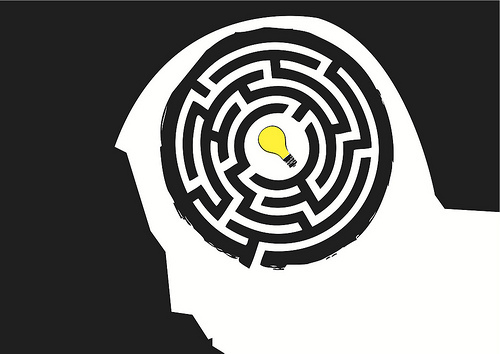 We'll be discussing themes, hubs, topics and events - so get your thinking caps on and come and join in the madness! Make sure you RSVP so we can ensure there are enough chairs for bums & nibblies. This October will see the return of one of the leading global multi-platform events in the mobile industry, Apps World, 2-3 October 2012. This year’s Earl’s Court event is set to be the biggest yet with over 5000 mobile marketers, developers, mobile operators and industry professionals expect for the two days. 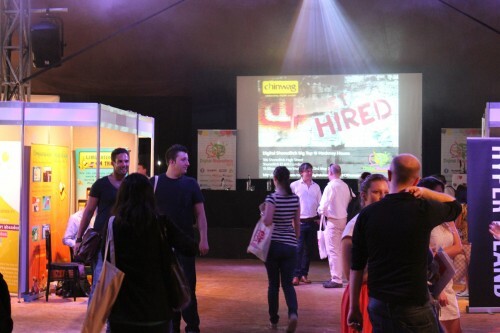 As an official partner of Apps World 2012, Chinwag have teamed up with Six Degrees to give you the chance to win two full access passes to the event in October. 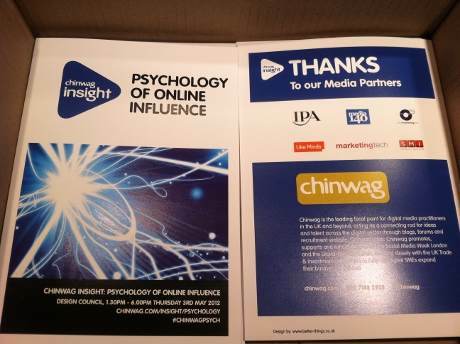 Thank you to all that attended the long awaited Chinwag Insight: Psychology of Online Influence conference yesterday. The afternoon was jam-packed with brain-busting insight from some of the leading experts from both academic and marketing worlds, bringing together theory and practice to build on the debate from the first event that took place during Social Media Week London in February. 1. Know your target, 2. Communicate persuasively, 3. Sell with integrity. Relate to what bonds people and drives them to share: shared history, attitudes, society and culture. 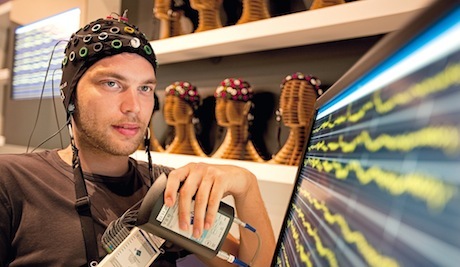 'Psychology: changing behaviour, increase conversions, cut costs'. Craig is going to explain his love of studying customers and testing new products, services and page designs on 28M+ website visitors. Using psychological principles, he'll explain how you can change consumer behaviour, increase conversion rates and lower running costs. Martin will be talking about 'Why Emotion Drives Your Bottom Line'. Stuart and Matt will discuss 'Using conversational analysis to understand influence and interaction'. We have a VERY exciting announcement regarding the future of Social Media Week London, and we wanted you to be the first to know! 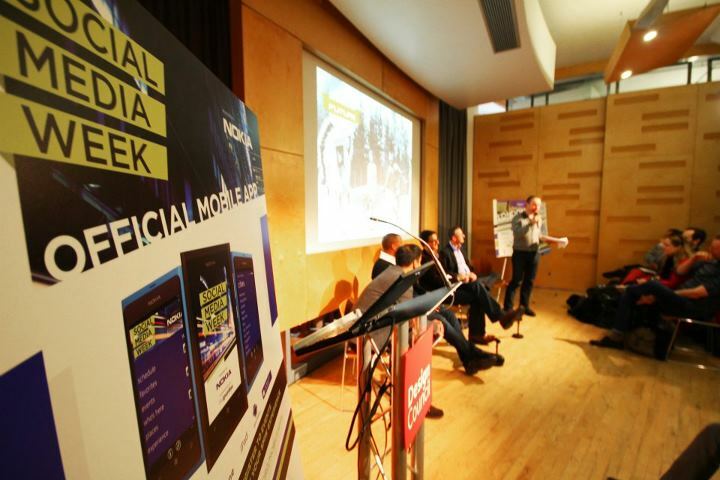 You may have already seen, the first few cities returning for September's Social Media Week lineup have been released. This September, London, Social Media Week's second largest city, will also be joining this initial lineup! For three consecutive years, Chinwag has hosted SMW London which will be moving from February to it's new September home as of 2012 onwards. The first batch of early-bird tickets have just been released for Chinwag Insight: The Psychology of Online Influence, a half-day conference on 3rd May in London that uses psychology to help marketers understand influence, decision-making, behaviour and intent. An afternoon spent extracting meaning from a sea of numbers? We're looking forward to it, too! 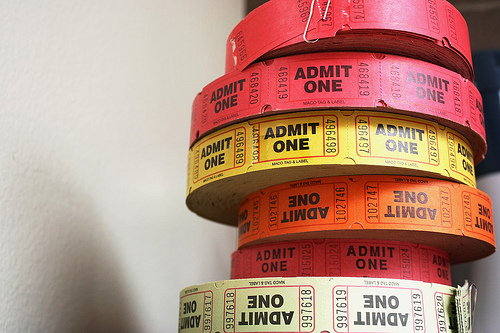 What better time to grab an early-bird ticket and for Chinwaggers (you'll need to login, or register if you're not a member already) there's a limited-time special offer to save an extra £50. 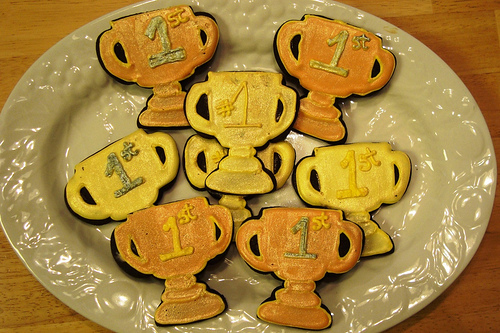 Our pals at BBC hosted their very own Social Media Week event in London this year. Did you catch it? 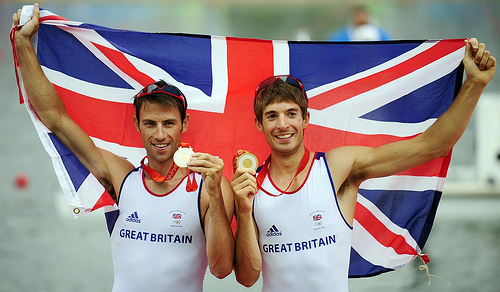 'Social Media, The Olympics and BBC - Preparing for London 2012' is now available on video, right here! The session boasted a very athletic panel, including Olympians Gail Emms, Zac Purchase MBE and Mark Hunter MBE. Also joining them was Roger Mosey, BBC Director for London 2012 and Lewis Wiltshire, BBC's Digital Olympics Editor & Social Media Editor, BBC Sport. 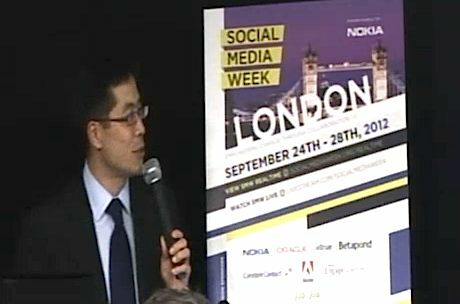 Did you happen to catch the Social Media Week London 2012 Global Keynote event? You can now watch it here! 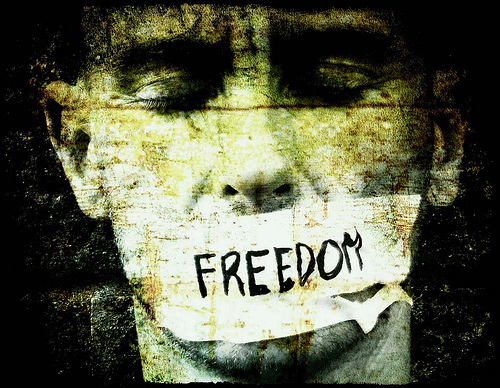 'Freedom of Tweet: Censorship, Governments, Marketers and The Law' features Kathryn Corrick conducting a live interview, discussion and Q&A session with Mark Stephens CBE, one of the UK's leading legal minds, a veteran of Wikileaks & Hackgate, reknowned for his take on global freedom of speech and censorship. Your votes are in, London! After a mammoth Social Media Week for 2012, it's time to reveal who you dubbed as this years best SMW Event and Speaker in London, as well as Social Media Personality and Campaign of the year! Thankyou to all who participated in voting, Chinwag is delighted to announce our catergory winners for the SMW Awards 2012, sponsored by 3 Monkeys. Watch the [email protected] event online now! If you weren't one of the lucky one's who managed to snap up a ticket, you can now watch the event online, right here! Hear the latest thinking on social media and our wider social worlds from Google experts, academics and advertisers. 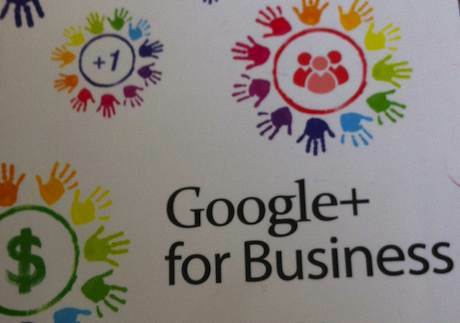 Social Media World Forum Europe 2012 - Discount for Chinwag members!